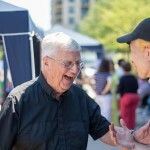 The new church for the St. Gabriel of the Sorrowful Virgin Roman Catholic Parish and the Passionist Community of Canada has been designed to reflect the eco-theology of Passionist, Father Thomas Berry and his belief that we must work towards establishing a mutually-enhancing, human-earth relationship. The first of two articles, featured in the previous issue, identified questions raised by eco-theology and suggested a constructive framework for the journey towards healing our relationship with the Earth. In this second article, the design of St. Gabriel’s church will be explored to demonstrate how we can respond to this imperative in a tangible, realistic, and meaningful way. The entire south façade of the worship space at St. Gabriel's is glazed with clear glass. 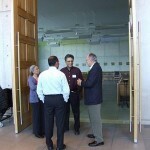 When asked by his own community to suggest an appropriate response, Thomas Berry replied with this simple question: “How will you address the sun?” In contrast to most churches that are inward focused and employ stained glass to create an other-worldly liturgical environment, the entire south façade of the worship space at St. Gabriel’s is glazed with clear glass. This has been done in order to passively harness the winter sun’s energy and to extend the sacred space of the worship area into the sacred space of the world beyond, emphasizing that when we gather to worship, we do so within the greater context of creation…the primary revelatory experience of the Divine. The remaining three walls of exposed architectural concrete serve as a constantly changing canvas for the dynamic play of natural light that is filtered by the coloured glass panels of the continuous perimeter skylight designed by David Pearl and further fractured by wall-mounted dichroic coated reflectors. In effect, the cosmos shapes the liturgical environment and participates in the ritual action of the liturgy. Similarly, time also takes on a cosmic dimension as the sun traverses the sky above. Seasonal influences on the sun’s intensity and inclination together with the daily diversity of weather conditions ensure that no two masses will experience an identical liturgical environment. The pews, re-claimed and re-furbished from the original church, have been arranged antiphonally in the new 750 seat worship space. The facing rows embrace a sacred north-south axis that begins in the garden and terminates at the north wall of the nave with the tabernacle. Immediately adjacent to the south wall of glass, with the garden as backdrop, the original marble font, re-designed to flow with “living water”, emphasizes that when we are baptized into the faith community, our Baptism also consecrates us for the sacred earth community. The re-furbished and transformed marble ambo and altar are also situated along this sacred axis with space enough to allow for processing the Word before it is proclaimed. Each has its own space defined by a marble platform with just a single step up from the floor needed to facilitate sightlines. A transparent screen, superimposed with etched glass panels depicting images of the Passion that were salvaged from the front doors of the original church, delineates an intimate chapel of reservation at the north end of this sacred axis. Movement from the south to the north is reinforced by the colours of the skylight. Brilliant yellows are situated closest to the sun’s intense light at the south end whereas the deeper, richly hued azure blues at the north end provide a beautifully mysterious and meditative light for the chapel of reservation and the reconciliation room adjacent. The ceiling of the worship space stops short of the walls on all sides, appearing to hover weightlessly over the congregation, the cosmic coloured light of the perimeter skylights spilling into their midst from an unseen source high above. The nave is entered from the narthex on the cross-axis through a pair of massive fifteen foot high paneled doors reminding us that Christ is our “gateway” to salvation. This central ceremonial aisle ends at the sacred axis, facing the presider’s chair, which is located in the front row of pews amongst the gathered worshipping community. The space at the crossing remains void, free to receive the gifts, the bride and groom, and the body of the deceased. It also serves as a place to identify the liturgical season, allowing the altar to remain unfettered as a primary symbol. Distinct from most suburban churches that are corralled by huge asphalt parking lots, St. Gabriel’s church accommodates the majority of its parking underground. This unprecedented investment ensures that a large portion of the ground plane remains devoted to the garden, landscaped to recall pre-settlement indigenous ecosystems and to provide a broad range of colour, depth, and wildlife habitat throughout the seasons. Preferential parking spaces are provided for those who carpool and those who drive hybrid vehicles. 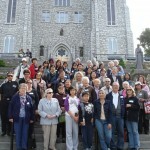 The unique charism of the Canadian Passionists attracts worshipers from well beyond their traditional parish boundaries. The new church, conveniently located within a few hundred metres of two subway stations, encourages these parishioners to leave their cars at home and arrive via public transit. Pedestrians who approach the church from Sheppard Avenue are greeted with “stations of our cosmic earth” situated strategically along the path through the garden. Based upon a series of eight stained glass windows commissioned for the chapel at the Passionist’s Holy Cross Centre for Ecology and Spirituality, the stations depict significant moments in the evolutionary story of the universe and the pilgrim journey of humankind within that story. The first station depicts the “big bang”, the initial bursting forth of energy at the beginning of time from which all else has evolved. The following two stations move through the coalescing of matter to form our solar system and the emergence of early life forms within the seething primordial broth of our planet’s oceans. The fourth depicts the emergence of the human. Juxtaposed to this station are the remains of a tree, its arching branches recalling the image of the cross. The copper cross from atop the original church roof is mounted to this tree, reflecting a contemporary understanding of the Passion of Christ including the Passion of the Earth. To continue their approach towards the church, visitors walk under the outstretched arms of the “tree cross”. Alternatively, they can choose to journey deeper into the garden past the remaining stations. If so, they first come upon the fifth station which depicts the beginnings of agriculture, responsible for the significant shift away from nomadic hunting and gathering towards settlement and a more pervasive human presence upon the earth. The station characterizes this change with the appearance of a deep fissure that both physically and symbolically identifies the emerging rift between humans and the rest of creation. In the next station, this fissure increases in breadth and depth to reflect the emergence of religions and non- indigenous cultures. Here the tree reappears, within its trunk and branches, the image of two human figures intertwined, one revealing an expression of suffering, and the other… an expression of ecstasy. The seventh station depicts the appearance of technology with the prophetic image of an atomic bomb’s mushroom cloud overshadowing the earth’s fertile green landscape below. The final station is out of sequence and is meant to represent a resurrection theme. Captured in a large mural made from colourful Murano glass tile mosaics salvaged from the front face of the original church, it describes in abstract form, the bursting forth of flowers that characterized the dawn of the Cenzoic Age of earth history after the extinction of the dinosaurs some sixty-five million years ago. After making their way through the garden, parishioners emerge upon a generously proportioned piazza designed to be used as a seasonal outdoor gathering space and staging area for weddings and funerals. The deeply recessed arcade that articulates the front wall of the narthex overlooking the piazza is a contemporary expression of the form and architectural detailing of the ancient Basilica of Sts. John and Paul at the Passionist world headquarters in Rome. Made of a unique limestone from Manitoba that is distinguished by its many embedded fossils of ancient sea crustaceans, the fabric of the narthex defines an important chapter in the geological history of Canada. 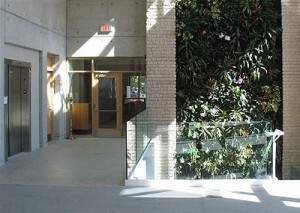 Inside, the narthex is terminated at the north end by a sky-lit, “living wall”. Water running over the roots of the living wall’s plant material conditions and purifies the air of the narthex and worship space. The enzymes in the roots of the tropical plants process the volatile organic compounds and other atmospheric pollutants while the water provides natural humidification during winter and de-humidification in summer. Parishioners rising from the underground garage are drawn into the light by the “living wall” and are reminded of their baptismal covenant by the sound of its purifying waters. They are also reminded of how the rainforests serve a crucial role of the rainforests for earth’s climate. At the opposite end of the narthex is a framed view of an outdoor water feature that harvests rainwater from the roof which in turn supports plant life within a constructed wetland. Potable water usage is significantly reduced by a highly efficient drip irrigation system for the garden, waterless urinals, dual low-flush toilets and low-flow fittings on all sinks. This helps to complete the narrative that underscores the irony of holding the precious natural resource of water as a primary religious symbol while willfully contributing to its ongoing degradation. Buildings in North America consume 40% of the world’s total energy, 25% of its wood harvest, 16% of its water and contribute 30% of its carbon dioxide emissions. As a LEED™ (Leadership in Energy and Environmental Design) registered building, the entire building process from design through construction, to the selection of furnishings, has been researched and re-thought to embrace and reflect the underpinning eco-theology that seeks to mitigate this impact. Maximizing insulation values; specifying highly efficient mechanical systems incorporating heat recovery methodologies; the supplemental use of passive solar heating along with utilizing the thermal mass of the building to store and retain heat; maximizing natural ventilation and daylighting; use of room occupancy and daylight sensors to control electrical lighting; use of carbon dioxide sensors to alert the building’s mechanical systems when fresh air is needed, are all strategies that have been used to reduce dependency on non-renewable energy resources. Minimizing finishes beyond those provided by the building’s concrete structure; re-directing construction waste from landfill to re-cycling opportunities; maximizing use of locally obtained materials; use of re-cycled steel and substituting a percentage of the cement with slag, (a waste by-product of the steel industry) not only represent good stewardship of precious earth resources, but along with the energy savings, also contribute to good stewardship of the parish’s financial resources through a reduction of ongoing long-term operational and maintenance costs. The further re-use of existing pews, stained glass, etched glass, and liturgical furnishings also helps to achieve these important goals while providing continuity of the rich heritage of Passionist presence within the parish. Use of low or zero VOC (volatile organic compound emitting) materials and finishes; carpets with a percentage of their fibres made from beets and corn stalks; formaldehyde-free wheat strawboard in all millwork; GreenGuard™ certified office and meeting room furnishings that meet strict environmental guidelines in their production, all contribute to creating a healthier environment for staff and parishioners alike. Incorporating these and other sustainable design strategies contributes to an understanding of early scriptural teachings that emphasized the sacredness of all creation and not just the sacredness of humankind. The new building as sacred space presents a “Gestalt whole”, and like the medieval cathedrals of Europe, becomes itself a form of Catechesis, engaging the senses and inviting transformation.